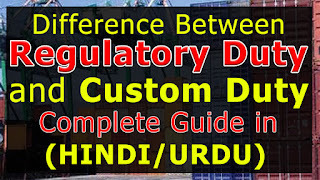 Difference Between Regulatory Duty And Custom Duty: In this video, we show you the Difference Between Regulatory Duty And Custom Duty In Pakistan -Define regulatory duty & Customs Duty. What is an ‘Import Duty ‘ Import duty is a tax collected on imports and some exports by the customs authorities of a country? It is usually based on the value of the goods that are imported. Depending on the context, import duty may also be referred to as customs duty, tariff, and import tax and import tariff. The Federal Government may, by notification in the official Gazette, levy, subject to such conditions, limitations or restrictions as it may deem fit to impose, a regulatory duty on all or any of the goods imported or exported, as specified in the First Schedule at a rate not exceeding one hundred per cent of the value of such goods as determined under section 25 1b or, as the case may be, section 25A. 2) Customs Duty imposed on All most Every Imported Item. 3) Regulatory Duty only imposed on imported items. 4) Customs Duty imposes on Import & Export Both. 5) In Export Government Pay Customs Duty to Exporter.